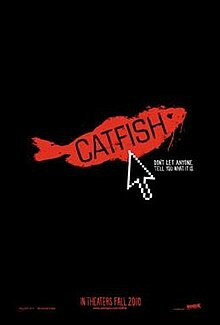 I recently watched the motion picture Catfish and was quite suprised how great of a movie it was. I felt that Catfish was a unique and innovative movie that offers viewers an amazing example of how infactuated and impactful social networking on platforms such as Facebook is on our society. I recommend everyone checking out this movie, its a unique and fresh concept for a movie that I think everyone can appreciate. Catfish is a relevent and up to date movie that is also a great example of movie studios adapting to changing trends and views. Plot: Catfish is a story about a women from a remote part of Michigan in the city of Ishpeming. Through the social media tool Facebook she was able to create many personas. This dramatic and elaborate fantasy life lures in a young photographer from New York City to further investigate her and her painting prodigy daughter. He then becomes so enthralled with this women and many people in her life that he travels to the remote area where she lives to answer his many questions about who these people are and what they are really like. When he gets there what he finds out is the last thing he ever expected. Takeaway: The movie Catfish shows the high impact social media has on our society and how powerful social media tools can be. You can create a perceived image by engaging interactions with a wide range of viewers through an interconnected network of people (viewers). Maintaining social media tools helps you communicate characteristics/features and gives a visual image to that can be used to form a perception for anything. This entry was tagged Catfish, catfish the movie, facebook, movie, social media. Bookmark the permalink.